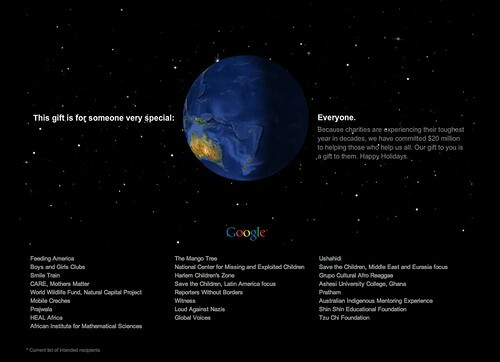 We thought Google was notgoing to give out holiday gifts, and in exchange, inviting publishers to lunch. 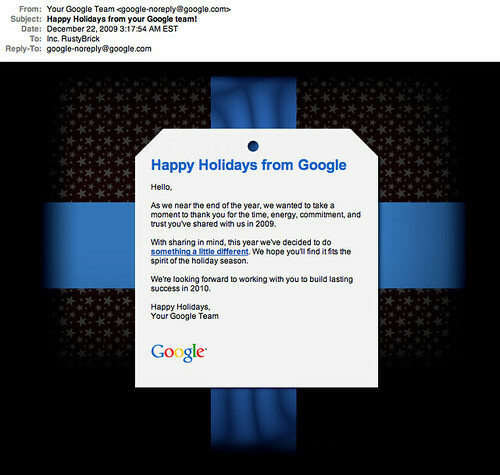 But starting yesterday, Google began sending out a holiday e-mail card to both advertisers and publishers. The card basically said Google is doing something a bit different this year and instead of giving out presents, they are giving $20 million to charity on our behalf. Overall, people are happy with this as their gift this year. We have thread at DigitalPoint Forums & WebmasterWorld. Want to see the previous years gifts? See 2008, 2007, 2006, and 2005.